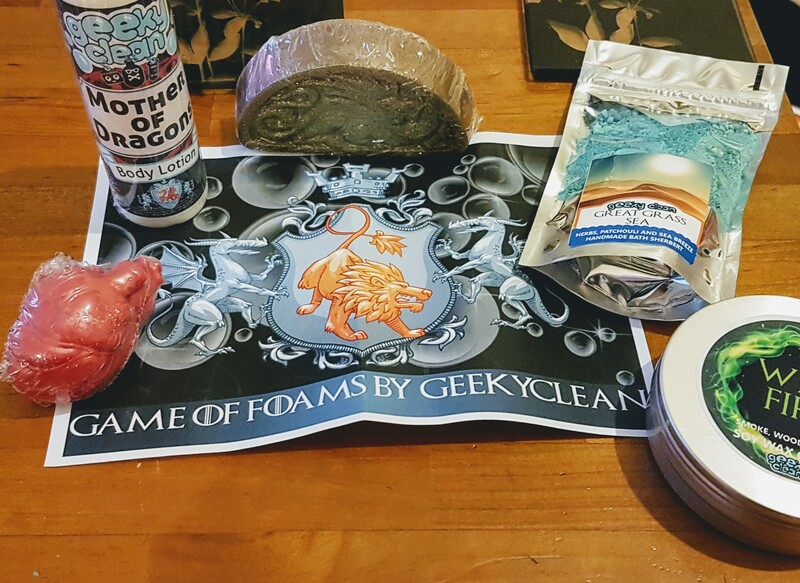 I was going through my Facebook news feed back in April and came across a sponsored post for a page called Geeky Clean, an online store selling handmade soaps, candles and other bath and shower products. I especially love the Harry Potter sorting hat bath bombs! 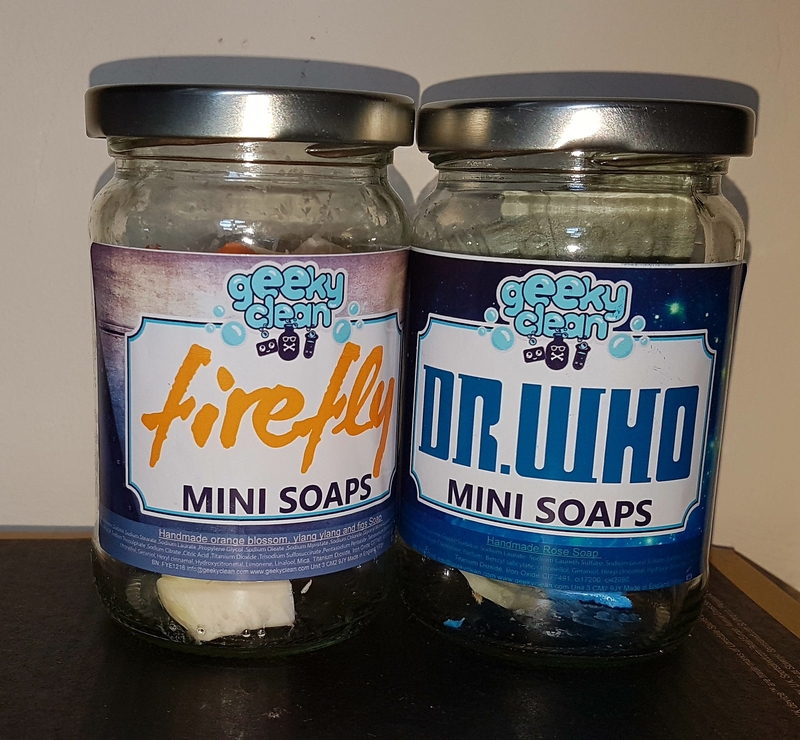 The post that brought me to them, however, was offering Serenity, Doctor Who and Star Trek themed soaps! Of course I bought all three (the latter being a gift for my dad). My ordered arrived quickly, was well packaged and I loved that the soaps were stored in little mason jars. Very cute! 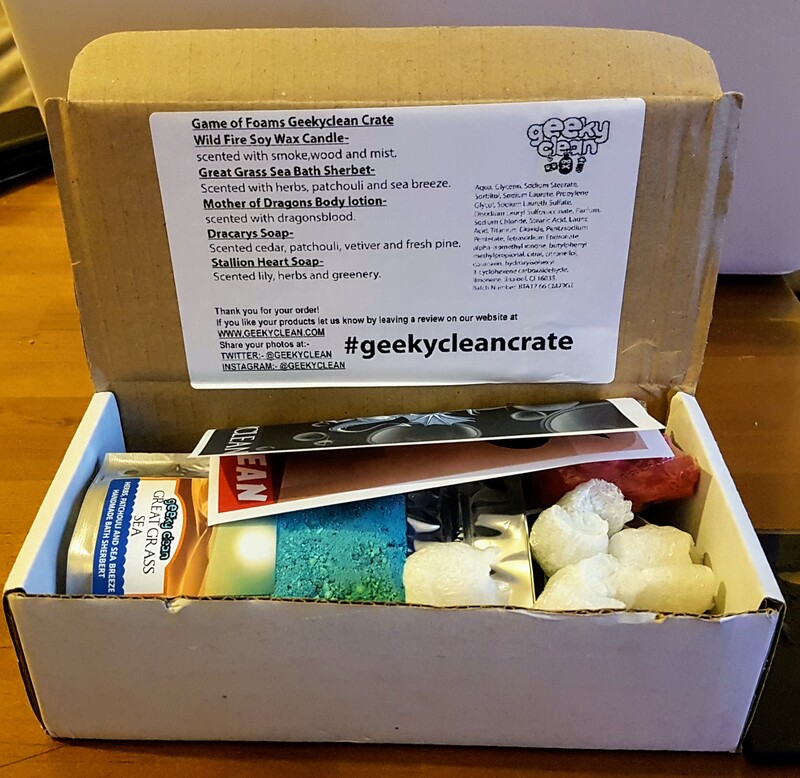 Every month Geeky Clean offer a themed crate of goodies. Each one is limited in numbers and features five unique, handmade items including candles, soaps, bath products etc. This used to be a subscription service but now you simply buy the crates you’re interested in each month, I much prefer this method. Last month’s crate was themed around Game of Thrones, as the new season is due to come out later this month (I’m really looking forward to it! ), I decided to buy one of the crates to celebrate and it arrived last week. It’s called ‘Game of Foams’. My crate arrived last week and I’m more than happy that it was themed around Mother of Dragons, 🐉 Daenerys Targaryen, who is one of my favourite characters on the show. 🐲 Wild Fire Soy Wax Candle – Scented with smoke, wood and Mist. 🐲 Great Grass Sea Bath Sherbet – Scented with herbs, patchouli and sea breeze. 🐲 Dracarys Dragon Soap – Scented with cedar, patchouli, vetiver and fresh pine. 🐲 Stallion Heart Soap – Scented with lilly, herbs and greenery. I love all the items and how well they suit the theme, and I will be looking at buying more crates in the future. This month’s is themed around superheros! Have you ever bought a beauty box / crate? What did you think? Any one else excited for Game of Thrones coming back to tv? NB: This post is not endorsed or sponsored by Geeky Clean and all opinions are my own. Hahaha, I love this! So clever to have this kind of subscription. 😀 I watched 4 seasons (I think) of GoT and just couldn’t watch anymore. It’s really not a nice show. I hate all the violence and how horrible people are to each other. So I stopped. Anyway, I hope you enjoy the new (and final?) season! Oh wow, that’s such a cool subscription! I’ve never heard of Geeky Clean before, but it looks fantastic. It’s such a lovely idea to make geek-themed products. I love that dragon soap! I once bought a Pokeball soap at a comic convention, which had a Pokemon inside. It was probably the best soap I’ve ever had. I’ve never bought a beauty box, but I’m thinking of buying a Japanese snack mystery box. Doki Doki Boxie do one off surprise boxes, where you get lots of different Japanese snacks, which sounds really good. I can’t wait for the final season of Game of Thrones! OMG I’d love a soap with a Pokemon inside or maybe a bath bomb!